Today’s blog calls attention to two critical industry factors. Over the past several years I have had the privilege of serving on the State of Connecticut Tourism Advisory Council. The Council reviews state spending on tourism, assists with strategy for the state marketing campaign, and reviews the impact of marketing on the tourism industry each year. Governor Dannel Malloy has been a strong advocate for investing state funds in marketing. He has proposed varying amounts of spending in his recent budgets, starting at $12 million several years ago. Unfortunately, many legislators and perhaps many citizens view use of state funds in this way as frivolous spending in the midst of hard times rather than investment that brings substantial financial return to Connecticut. 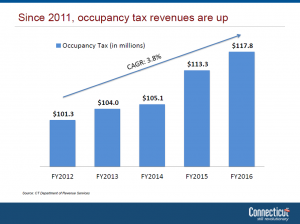 Since the state began investing in marketing, hotel occupancy tax revenue has grown from $101 million in 2012 to $117 million in 2016. Total revenue since 2012 from this tax exceeds $500 million, and additional revenue is generated from the rental car tax, sales and income taxes generated by the tourism industry. Total consumer spending related to tourism in Connecticut has exceeded $14 billion since 2012. 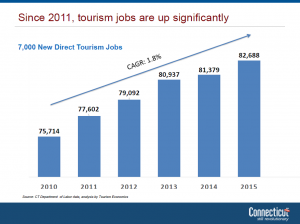 More than 7,000 tourism related jobs were created during this period, bringing the total workforce in the Connecticut Tourism Industry to 83,000 people. Taken singularly any one of these indicators proves that investment in tourism marketing pays dividends to the Connecticut general fund. Taken as a whole, the return on investment is astronomical. Despite the evidence that it is a solid investment, the Legislature has cut spending for tourism marketing every year. Well-intentioned as a means for saving money, the cuts have the opposite effect. Reduction in spending on marketing is already negatively impacting revenues to the state and stalling economic growth. Hotel occupancy, a key indicator of tourism, stagnated last year despite growth in neighboring states. 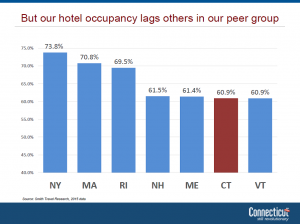 Hotel occupancy already lags our neighbors in New York, Rhode Island and Massachusetts by a combined average of 10.5%. People who would visit and stay in Connecticut are going to these states, a net loss to our state in tax revenues and economic impact. Two of those three states, New York and Massachusetts, significantly outspend Connecticut in marketing, at $55 million and $11 million respectively. Rhode Island, which is substantially smaller than Connecticut, is spending about the same as we are and planning to increase its marketing in coming years. As the State Legislature deals with a challenging budget for 2017-2018, investment in marketing must be increased, not decreased. There is sufficient evidence to show that the State’s coffers and the economy as whole will benefit exponentially, making the tourism marketing line item a profit center, not a cost center. Monday, Ringling Brothers announced that the Ringling circus is closing down after more than 100 years in operation. Dropping attendance, after the elephants left the circus in 2016, was cited as the reason. Tuesday Peta activist Ashley Byrne appeared on MSN’s “Inside Edition” (see link) to ballyhoo the shuttering of Ringling Brothers circus. Byrne says the closure of “The Greatest Show on Earth” is the just the start. Zoos are next, she said. She cited the notorious 2016 incident at the Cincinnati Zoo, where Harambe the gorilla was shot after a child fell into his compound, as an example of animals suffering. “Animals deserve better. They deserve better than to be put on display for entertainment,” she told Inside Edition. First off, what are the credentials of this vocal activist? She is all about animal rights. Unlike zoos, Peta does not spend a dime helping species survive in the wild. Zoos around the world are spending $350 million annually to ensure a future for highly endangered animals in the wild. Zoos are concerned with animal welfare, while Peta is concerned solely with “animal rights.” Peta has NO concern for the future and fate of wildlife. Secondly, zoos are not circuses, but safe havens for many species that are being hunted to extinction or that have no habitat left in the wild. While the attendance of Ringling Brothers Circus has been dropping precipitously, almost all accredited zoos have been GAINING visitors. That has certainly been true of our Zoo, where 3.2 million is now the new normal—a number we could not have imagined reaching only a decade ago. Today, with well over 50 percent of our populations living in cities, we are rapidly becoming divorced from the realities of the animal world. The dialogue we see in the media, read on blogs and hear in conversation makes it clear that many people have lots of ideas about what’s happening in our natural world, much of it not correct. This lack of knowledge is concerning in a world beset by environmental problems, where species are disappearing at an alarming rate. We need people to understand the changes taking place in our natural systems and to appreciate that each of our actions has an impact. More interest and knowledge, not less, is essential. Zoos and aquariums provide access and a vital connection to the world of wildlife and our environment, helping to foster an understanding of nature and how it works, and an appreciation for why it matters. Most professionally operated zoos and aquariums, like our Zoo, are dedicated to raising awareness and participation in addressing conservation issues. They conduct active programs that aid species survival, research and conservation, both at home and in the field. They save animals from extinction. So are zoos next? No. Zoos are more relevant than they have ever been and as visited as they have ever been.